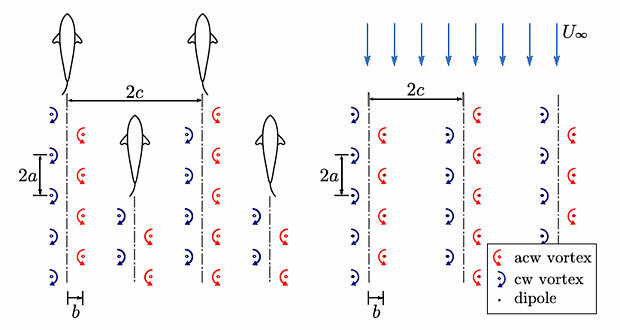 A trio of CalTech students released a paper today arguing that wind farms could yield much greater power density if they were modeled on formations of fish. The most widely used wind turbines have a propeller-like horizontal axis of rotation that converts more than half the energy of the wind it is exposed to, but these turbines must be kept far apart from their nearest neighbors to be effective. They discovered that staggered rows of freestanding turbines alternately rotating clockwise and counterclockwise creates similar vortices, accelerating the wind and increasing energy capture. Their findings could reduce infrastructure expenses associated with setting up wind farms and make wind power more viable for countries that have lots of wind but not much space, like Japan. Remarkably, the Caltech crew isn’t even the first group of researchers to suggest that we can learn a lot from fish about how best to capture wind. In 2008, the company WhalePower proposed a new kind of wind turbine modeled on the bumpy flipper of the humpback whale, an idea it has since extended to room fans. Okay, fine, a whale is a mammal, not a fish, but the point remains the same: The creatures of the sea appear to have plenty to show us about how to address our energy needs on land.